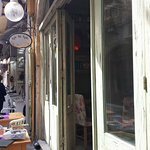 Description: A modern reinterpretation of the classic Cretan Rakadiko - a place to eat small plates and drink raki. 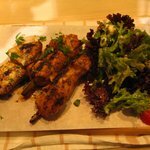 Top quality mezedes plates, come thick and fast; it's food to be shared. 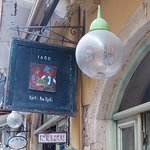 Choose imaginative Cretan tapas, such as local organic pork sausage, hand-picked mountain greens in phyllo, crispy smoked pork cigar rolls, hot Feta with caramelised figs and fried snails in rosemary sauce. It's relaxed dining, in a stylish setting reminiscent of an old grocery store, and perfect for a group of friends. 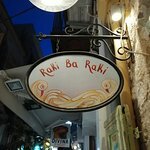 Known for the best mezedes in town, creative Cretan flavours you won't find elsewhere, excellent quality Raki and a friendly and smilling staff! Went for dinner as recommended by our hotel owner. We were not disappointed. We had five mezedes dishes, with a litre of house wine and it cost under €35. Service was good and friendly. Food was excellent. We just had a fantastic meal with great mezze including tarama that was incredible. The mains inlcuded the daily special of stuffed rolled pork and grilled calamari which were fantastic. 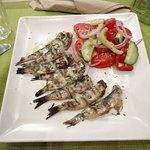 We have eaten very well in Crete but this was our best meal - and of course becuase it’s Greece the quality far exceeded the cost. We were here in the winter time - so really not many tourists. Very authentic and tasty food. Recommended! 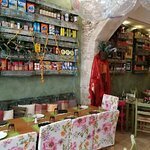 In a proper atmosphere of a Greek mezedopoleio (Greek tapas restaurant), tastes are diverse, but genuine, and tsikoudia (or raki) is matching the local mezedes (tapas). Belonging tot the same family which owns Avli apartments, has the same -high- quality standards. The mushrooms were exceptional. 'Pihtogala' was a perfect match for all other dishes, and the octopus salad a best match for the raki. Prices are fair and service was friendly and fast. 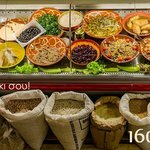 Overall a top value for money choice in the center of the old city. Cannot believe the negative reviews, this place was awesome. We found it for lunch on a day trip and had to go back for dinner later in the week. We were staying 65km away but worth the effort! Food was amazing, house wine was fabulous, service was outstanding! Try the sausages and the bugatsa for desert! 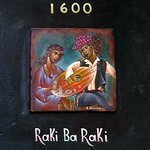 Been to Raki Ba Raki 1600? Share your experiences!